This is a Hand Signed White Card 5" x 4" by the late Commander of 145 Squadron who was acredited as having fired the first shots in the historic Battle of Britain. Group Captain John Peel , who has died aged 92, was credited with firing the first shots of the Battle of Britain, in which he commanded a Hurricane fighter squadron. Peel was already an experienced regular officer when, in July 1940, he was appointed to command No 145 Squadron, based at Tangmere on the south coast. Shortly after his arrival, he shared in the destruction of a Dornier bomber. Four days later he was leading his squadron against a force of enemy bombers when his aircraft was hit by return fire. Despite serious damage to his Hurricane, he pursued an enemy bomber 25 miles off the coast and is believed to have destroyed it. As he returned over the English Channel, Peel was forced to ditch south of Selsey Bill. He was found five hours later, semi-conscious in the sea, by the Selsey lifeboat. The next morning he was again leading his squadron, and over the next few days shared in the destruction of two more German bombers. On August 8 - the day which subsequently became acknowledged as the first of the Battle of Britain - Peel is said to have fired the opening shots. When the Germans mounted an attack on an important convoy, CW 9, Peel's squadron was scrambled. He shot down an Me 109 and a Stuka before damaging a second of the dive bombers. Many fighter squadrons came to the defence of CW 9, but only Peel's was engaged three times, and he led it on each occasion. 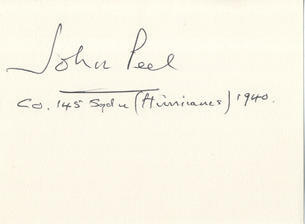 One historian stated that: "Sqn Ldr John Peel's Hurricane pilots had fought the fight of their lives." After completing his final sortie, Peel discovered that he had to provide a pilot for night-readiness. Four of his young pilots had been lost during the day's fighting, so he detailed himself for the duty "to rest the youngsters". Three days later he was wounded when enemy fighters damaged his Hurricane, forcing him to land on the Isle of Wight, where the men from a local gun battery pulled him from the wreckage. On August 13 it was announced that Peel had been awarded the DFC. The citation stated that "his outstanding quality as a leader has raised the flying standard and morale of his squadron to the highest pitch". The son of Colonel Basil Peel, DSO, of the Indian Army, John Ralph Alexander Peel was born on October 17 1911 at Boscombe, Hampshire, and educated at Clifton. Having entered the RAF College at Cranwell as a flight cadet in September 1930, he excelled at sport, and graduated as a pilot officer in July 1932 when he joined No 19 Squadron, flying Bulldog fighters at Duxford. In January 1934 Peel was appointed to No 801 (Fleet Fighter) Squadron flying from the aircraft carrier Furious. He later joined the permanent staff of No 601 (County of London) R Aux AF Squadron as a flying instructor, before returning to Cranwell as the College adjutant. In September 1937 Peel returned as an instructor to No 601, known throughout the RAF as "the Millionaires' Mob", based at Biggin Hill. During Peel's time, the squadron's members included Max Aitken and Roger Bushell, who was later the mastermind of the "Great Escape" and was executed by the Gestapo. Peel was promoted squadron leader in 1940 and appointed to lead No 145 Squadron. After his service during the Battle of Britain, Peel was appointed wing commander, and left No 145 in January 1941 to become the first leader of the Kenley Wing, which was equipped initially with three Hurricane squadrons, and included the Poles of No 312 Squadron. Kenley was one of a number of Wings, led by experienced fighter pilots, which were formed in early 1941 by Air Marshal Sholto Douglas, the C-in-C of Fighter Command; his plan was to send his squadrons on the offensive over northern France to engage the Luftwaffe fighters. In addition to providing escorts for bomber formations, the fighter squadrons also carried out sweeps against ground targets. On April 7 Peel led his squadrons on a low-level machinegun attack against Berck airfield, and he destroyed or damaged three German fighters as they prepared to take off. Throughout that summer Peel was in action over northern France. On July 9 his Wing was escorting Stirling bombers on a raid to Mazingarbe when the formation was attacked. Peel's Hurricane was badly damaged, and he was forced to ditch off the French coast and take to his dinghy. An air-sea rescue aircraft located him and directed an RAF high-speed launch, escorted by a Navy patrol boat, to the scene. As the rescue launch came alongside, German fighters attacked it; the crew threw Peel a tin helmet and shouted that they would be back. Spitfires were called to provide cover, and they engaged the enemy fighters as Peel was snatched to safety. The next day he was once again leading his squadrons on another raid over France. On leaving the Wing on August 5, Peel was awarded the DSO. In November 1941 Peel was appointed Sector Controller and Wing Leader at Debden; he was in the post for 14 months and was twice mentioned in dispatches. Promoted to group captain in January 1943, he became Deputy Director of Fighter Operations at the Air Ministry, where he remained for almost two years. After a tour in the personnel department of the Air Ministry, he was sent to the Central Fighter Establishment, where tactics were being devised for the new generation of fighters, including the first jets. Peel was appointed the first post-war Assistant Commandant at the RAF College Cranwell in January 1947, but a year later he decided to leave the RAF to take up farming. Initially, he farmed in Cambridgeshire before moving to Devon. In the early 1980s he retired to Wiltshire; he had always had a talent for art, and he now spent most of his time painting. Some years after the war Peel had returned to Selsey to see the lifeboat crew which had rescued him in 1940, and he became a life-long supporter of the RNLI. He had a great love of the countryside, and was still taking long walks on Salisbury Plain in old age.